Harvest Moon: Back to Nature is a game in the farm simulation series Harvest Moon, developed by Victor Interactive Software. 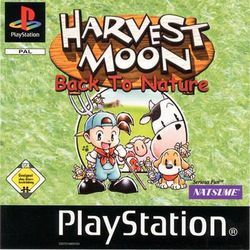 It is the only Harvest Moon game developed for the original PlayStation, as well as the first Harvest Moon game for a non-Nintendo console. Characters from Harvest Moon 64 were transferred to be the characters in this game, although with new lifestyles, personalities, and relatives, including the wooable girls from Harvest Moon 64 (Ann, Elli, Popuri, Maria (known as Mary), and Karen). A girl-oriented remake Bokujō Monogatari Harvest Moon for Girl (or simply "for Girls"), was also developed, but until 2007, had not seen a localized English release. The setting of this game was later transferred to the 2003 and 2005 Game Boy Advance games Harvest Moon: Friends of Mineral Town and Harvest Moon: More Friends of Mineral Town. Also, the game was coupled with the girl version and ported in 2006 (2007 for North America) as Harvest Moon: Boy & Girl for the PlayStation Portable, although the box art and instructions portrayed it as a completely new game. In 2008 Marvelous Interactive released Harvest Moon: Back to Nature and Bokujō Monogatari Harvest Moon for Girl for the PlayStation 3 and PlayStation Portable via the PlayStation Network. Years ago, the main character, Jack, came to his grandfather's farm for the summer. His grandfather was too busy taking care of the farm to spend much time with the boy, but the boy was free to explore the town and the forest as he wished. Jack befriended his grandfather's puppy and met a little girl his own age with whom he became close friends. When Jack's grandfather died years later, Jack had grown into a young man, and he came to the town again to take over the farm. The mayor talked things over with the village, and they had decided that Jack could stay as the rightful owner if he could restore the farm back to its original state. But if Jack couldn't restore the farm, or wasn't able to get along with the villagers, he would have to leave. This page was last edited on 25 October 2015, at 20:04. This page has been accessed 16,686 times.